In Office 365, customers can use the Microsoft Online Services Module for Windows PowerShell (MOSMWP) to configure their user passwords to never expire. The following steps can be provided to customers who want to configure these settings for their users. Connect to the Microsoft Online Services Module for Windows PowerShell by using your company administrator credentials. 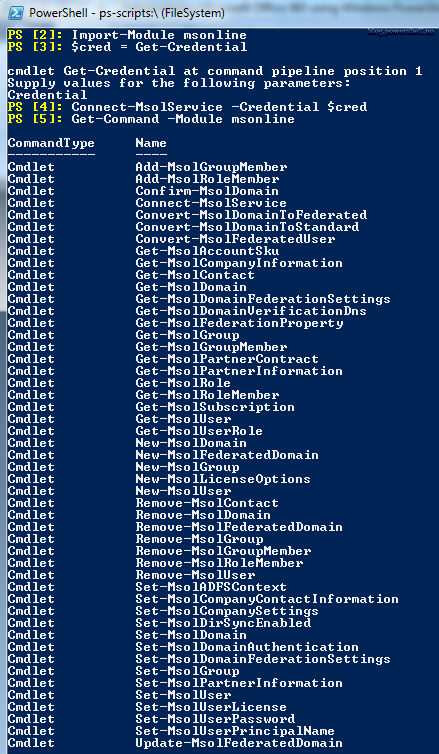 Connect to the Microsoft Online Services Module for Windows PowerShell (MOSMWP) by using your company administrator credentials. The PasswordNeverExpires setting for synchronized users must be configured by using the steps earlier in this article. There is no Active Directory property that can be synchronized to Office 365 to set the PasswordNeverExpires setting. Um, Easier way? Or do I need to just go to linux if I wanna be a freakin CLI geek? As of June 2013, this process no longer works. The "microsoft online services module", above, will download but not install. Actually, the process still works fine as given 6-20-13. Follow the steps exactly. I launched the Microsoft Online Services Module for PowerShell, and then input the commands there. "Connect to the Microsoft Online Services Module for Windows PowerShell by using your company administrator credentials" Can't bother yourself to mention how to do this? only i find that the link download for the above "Microsoft Online Services Sign-In Assistant 64-bit" has some issues to Launch the PS. Microsoft Online Services Module for Windows PowerShell 64-bit says it needs Microsoft Online Services Sign-In Assistant 64-bit 7.0 or newer. i can’t install 7.0 as the version i have is …. newer. Thanks alot..the link you gave to download Microsoft Online Services Sign In Assistant for IT Professionals BETA..worked for me!